Schools have different policies about teacher gifts. In some schools, the parents' association collects money and buys each teacher a gift, while in other schools, parents can give what they wish to teachers, administrators or to other staff. Some schools provide guidelines for parents to follow, while others leave this completely up to the students and their families. While there are urban legends (some of them true) about parents providing teachers with lavish presents and, more commonly, providing college guidance officers with expensive gifts throughout the year, it is generally more suitable for parents to buy teachers gifts either during the winter holidays, during National Teacher Appreciation Week (which takes place in early May) or at the end of the school year. While some families pride themselves on finding the perfect gift that suits a teacher's personality, others opt for homemade gifts or treats, while others look for gifts that help the teachers in the classroom. If you're not sure what your teacher needs or wants as a gift, opt for a gift card. General gift cards to places like Amazon.com or Barnes & Noble can be perfect. If you know your teacher's favorite coffee shop, grab a gift card to his or her favorite shop. Don't fret over the amount, either, it's the thought that counts. While many private schools are fortunate enough to have well-stocked libraries, teachers often compile lists of the books, DVDs, programs, or technology that they need in their classrooms that go above and beyond the annual budget. It may be a good idea to start with your school's librarian when looking to buy a teacher a gift, as the librarian may keep a list of what the teacher needs, including not only titles that relate to the teacher's curriculum but also magazine subscriptions or DVDs that can support their teaching; you can also give gifts to the library to thank the deserving librarians. A technology teacher can let you know if your child's teacher or the tech department have specific requests for their classrooms. You can never go wrong with an extra hard-copy edition of an inspirational book or one that the teacher uses in the classroom. If you are looking for titles, you can start with the ten most commonly read books in private high schools, which often appear on school reading lists. There are a number of movies about private schools that make good teacher gifts, including The Dead Poet's Society (1989), The Emperor's Club (2002), and the classic Goodbye, Mr. Chips (1939). Another great film about an English prep school is The History Boys (2006), based on a play by Alan Bennett. It's about a group of bright, outspoken boys at a provincial British high school who are coached to pass the written exams to get into Cambridge and Oxford by a set of eccentric faculty members. Though the movie takes place in Britain, the students and classroom discussions are similar to those at American private schools. Keep in mind that a cookie and a note go a long way. The best gifts I ever received as a teacher were thoughtful notes written by my students and their parents. I keep every single one of them, as do many of the teachers and faculty I know. One administrator I met even tacked every single thank-you note he had ever received to his bulletin board. He would look at these thoughtful notes on bad days. These notes are wonderful pick-me-ups and reminders to teachers why they do the hard work that they do all year. You can accompany the note with a coffee mug customized to the teacher's interests (for example, featuring a writer or a mathematician), or you can use this baking website to make some cookies to go along with the note; nothing will be sweeter. This can be a great way for a family to show their appreciation for a teacher while benefitting the school's annual fund. Make a donation of any amount that you are able to make, and you can designate the gift to be in honor of one or more teachers. 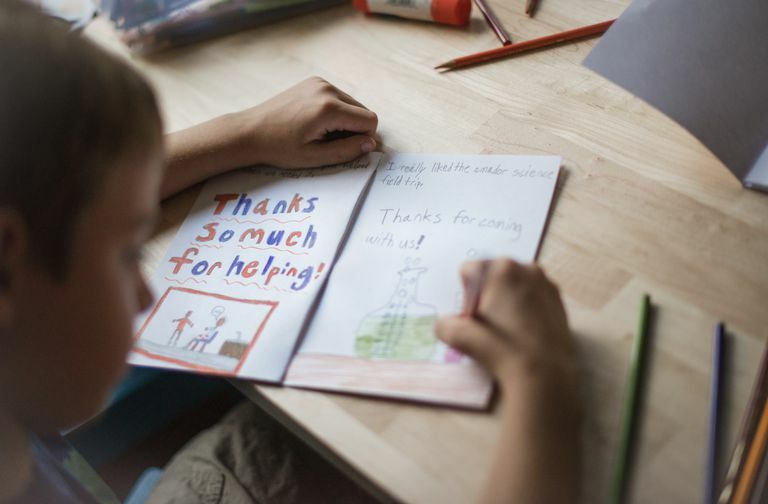 The development office will usually send a note to the teachers letting them know that a gift was made in their honor, but you can also send a note stating that you've done this simple act. Your gift to the Annual Fund will be put towards the general budget which benefits all aspects of the school, enhancing the experience for your child and his or her teachers.